High Court Judge, Navindra Singh on Monday quashed fraud-related charges against former Deputy General Manager of the Guyana Rice Development Board (GRDB), Madanlall Ramraj. Defence Lawyer, Anil Nandlall emerged from an in-chamber hearing with the judge to whom he showed the heavily obscured contents of the report titled “Guyana Rice Development Board Forensic Audit Report for the period November 1, 2011 to May 31, 2015”. Nandlall told reporters that “the judge has correctly ruled that his order has not been complied with and that all the charges are stayed against Ramraj”. 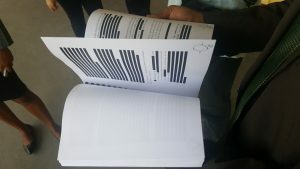 Almost all of the pages of the report were blotted out, leaving only very few parts of a small number of pages available to be read. After the Special Prosecutor for the Guyana Police Force repeatedly failed to hand over evidence to the Ramraj’s lawyers to prepare a defence, he moved to the High Court citing Article 144 of Guyana’s Constitution of Guyana as giving him the right to be afforded facilities for preparing his defence and other protections of the law. Sase Gunraj, who is representing Badrie Persaud and former Deputy Permanent Secretary (Finance) of the Ministry of Agriculture, Prema Roopnaraine, moments later told Demerara Waves Online News that he would be appealing a decision by the Chief Justice, Roxane-George Wiltshire that she could not instruct the Magistrate’s Court how to conduct its business and it was for the Magistrate to decide whether or not to stay the proceedings. Ramraj and now Canada-based GRDB accountant Peter Ramcharran were charged last year with 34 fraud-related charges. He was charged jointly with former GRDB General Manager, Jagnarine Singh. They were accused of ommiting to enter or make true entries of more than GY$4.2 million into the GRDB’s ledger between 2011 and 2012. Further, they are accused of fraudulently taking GY$5 million or applied the money for their own use and benefit. Singh and former GRDB Board member, Nigel Dharamlall are represented by Attorney-at-Law, Glen Hanoman.